Amaroo was damaged during hurricane Irma and was shipped back to the UK o be repaired in June 2018, work is well underway and they are sailing back to the Caribbean in November with the ARC. In March 2019 she is heading to Panama and heading through the canal with the final destination being Australia. The Hanse 575 has a very large freeboard which inside the yacht gives an incredible feeling of space, the saloon is referred to as an apartment and has a feeling of home from home as its so comfortable. The high ceiling give over 2 meters of height throughout the saloon and cabins. She can take up to 6 guests in 3 cabins all with en-suites. 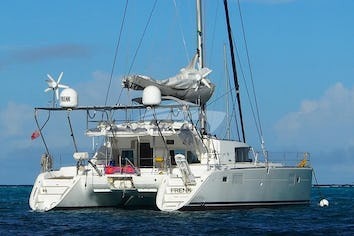 She has air-conditioning throughout, water-maker and generator. 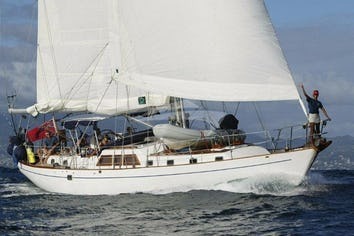 She has a fully battened mainsail carbon boom with lazy bag. In the cockpit, she has a spray hood, 2 cockpit tables & 2 L shape sofas that can convert into sun beds. Amaroo's captain, Jamie & her chef/hostess, will make sure you are well looked after; keeping the boat in immaculate condition, providing delicious meals and showing you the most beautiful anchorages, crystal clear waters & best snorkelling spots. Jamie was born in the UK and grew up in Farnham an hour south west of London. The film ‘Swallows and Amazons’ is the main inspiration for Jamie's love for sailing, shortly after watching Jamie learnt to sail racing on Frensham ponds crewing cadet dinghies at the age of 7. Weekends and summer holidays were spent exploring Poole harbour completing several RYA dinghy courses. At the age of 20 Jamie completed his Yachtmaster offshore in Moreton Bay - Australia. 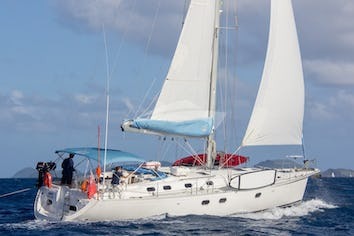 Since then skippering on flotilla and private yachts in Croatia, Italy, Greece, Australia, BVI and looking after Amaroo for the past 2 summers chartering on the South coast of UK.